To soak the beans, place them into a large bowl and cover with three times the amount of water. Let soak overnight, or for at least 12 hours. Once the beans are fully rehydrated, drain and rinse again with clean water. To cook the beans,place them in a large pot and add enough water to cover. Bring the water to a boil and then turn the heat down and let the beans gently simmer for approximately 50 to 60 minutes, or until the beans are mostly tender and soft, but not at all mushy. Once done, drain the beans and set them aside — being sure to save the cooking liquid. This flavorful liquid will be used later when cooking the dish. <strong*Note: For the tomatoes, we most often use canned tomatoes. 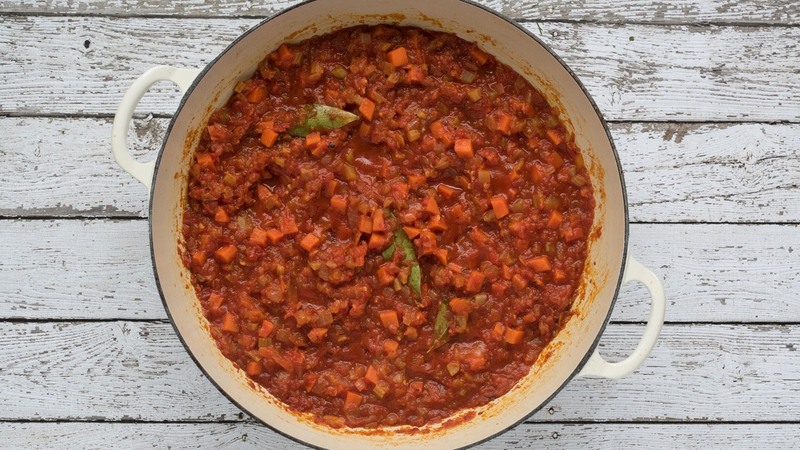 For the best final consistency, pulse the diced tomatoes a few times in the food processor before using. As far as the ingredients and spices go, there are many versions of this traditional Greek dish — some recipes do not add carrots, while some recipe call for adding a bit of cinnamon. This is where you can get creative and experiment with different amounts and/or types of spices, flavorings or mirepoix. Flavor-wise, we really like this combination of ingredients. To start the sauce, heat a large ovenproof skillet or large frying pan, over medium heat. Then add the olive oil, followed by the onions, carrots and celery. Let the mirepoix cook for 10 minutes or so, or until soft and translucent — a bit of color is okay. *Note: If desired, omit the oil and use a bit of vegetable stock instead. Next, add the garlic and chile flakes and cook for about 30 seconds. Then add the tomato paste, cooking for about a minute before adding the tomatoes, oregano, paprika and bay leaves. At this point, turn the heat down and let the sauce simmer for about 10 minutes or so, or until the sauce starts to thicken. Once the sauce is ready, add the fresh parsley and dill and taste for seasoning. 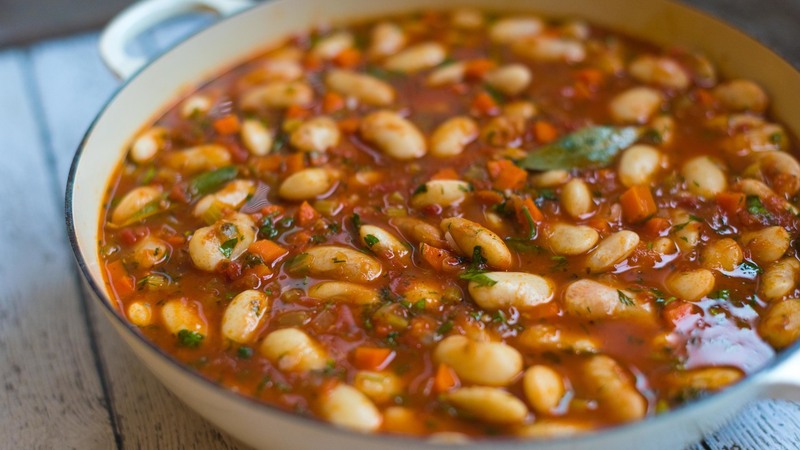 To assemble the dish, either add the beans to the pan in which that tomato sauce is in, or transfer them both to an ovenproof casserole or baking dish. Next, add about a cup of the cooking liquid — enough liquid to just cover the beans. Bake for the beans for 1 to 1 1/2 hours. Check the beans occasionally, adding more liquid more liquid if the mixture seems too dry. Once done, the liquid should be mostly evaporated and the beans should be tender, but not too dry — a bit of sauce is nice. At the end, if desired, the oven temperature can be turned up to 400°F (200°C) for the last 10 minutes or so. This will allow any excess sauce to reduce and it will also crisp up the top nicely. Note: When done, if the mixture seems a too dry, you can always add a bit more of the cooking liquid. It’s also a good idea to save any remaining cooking liquid because it is very flavorful and can be used to reheat any leftover beans and/or for making other dishes. In the end, the final consistency comes down to personal preference. 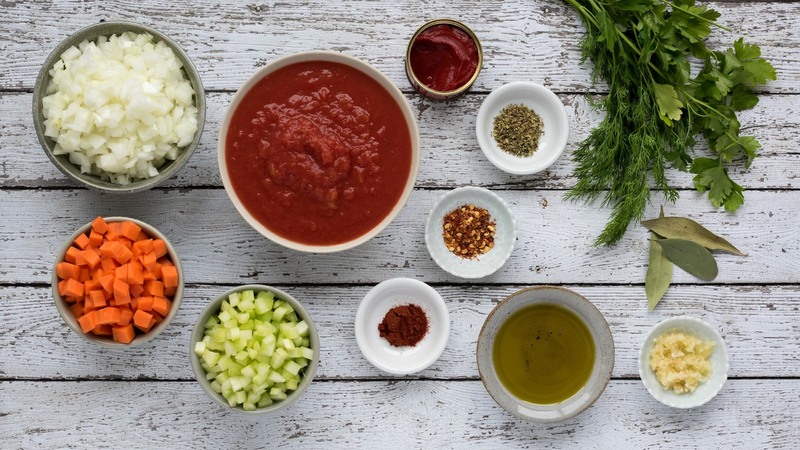 Once you have a made it once or twice, you will find what you like best — saucier or less saucy. To finish the dish, drizzle with a bit of extra virgin olive oil, fresh parsley and a little coarse salt, if desired. Either serve the dish on its own with some bread and a big salad, or serve as part of a multi-dish Greek feast. Traditionally Gigantes Plaki is served only slightly warm or at room temperature, so be sure to let sit for at least 15 minutes before serving. This dish goes particularly well with many of these delicious plant-based Greek recipes: Hummus, Tzatziki, Lemon Potatoes, Dolmades and Pita Bread. 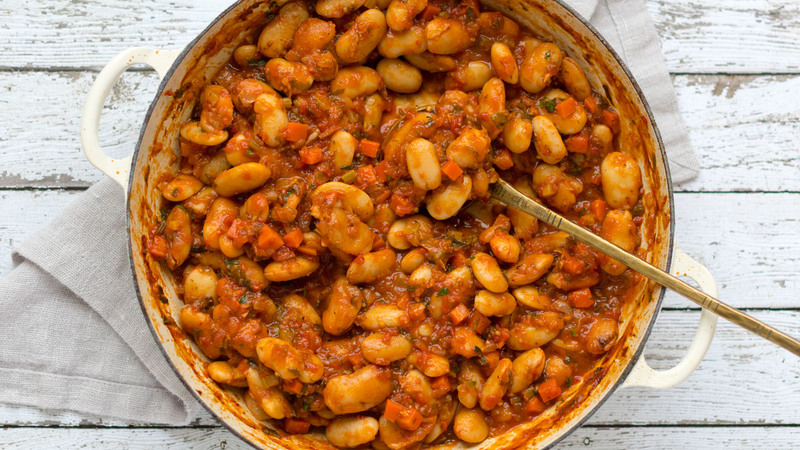 Gigantes plaki (yigandes plaki, γίγαντες πλακί) is a traditional Greek dish consisting of oven-baked fasolia gigantes (giant) beans in a rich tomato sauce. 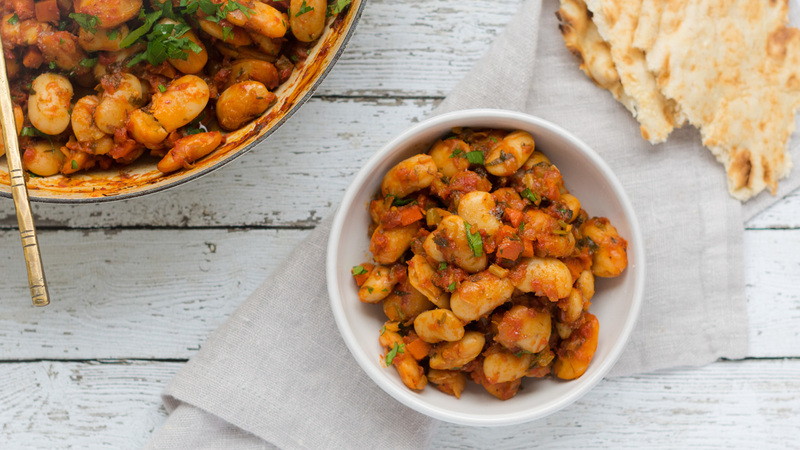 Gigantes beans, which are native to Greece, are also called elephant beans (elephantes), which is the name reserved for extra-large giant beans. 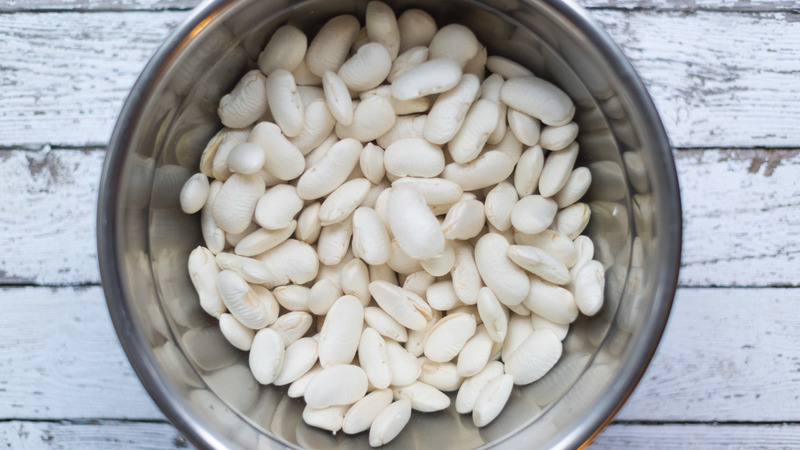 The large white gigantes beans can be found at most Greek grocery stores. They can also be ordered online. If you have not tried them before, they are well worth any effort it is to find them — they are meaty and delicious. This is my ultimate favorite dishes when I travel to Greece, I can never get enough of them. Was very excited to make this dish. It turned out well but not like in Greece...it was missing something for me. The beans took much longer to cook for me, I wasn't sure why. The dish itself I did enjoy and will make it again for sure. Thank you. I followed almost all of this as the instruction stated, with a few changes. For step three i used a lot less oil (but still some, I think the mirepoix is best with at least a little bit) and then I put the whole lot in the slow cooker, it worked beautifully. I've also done it using soaked dried beans rather than cooked beans in the slow cooker and it was great, I just added a little more liquid. Such a great, easy, cheap recipe, thanks folks. Excellent, Kathleen! Thank you for the additional commentary for the Rouxbe community! This is a wonderful dish! I'm making it for myself for my birthday, that's how good it is.